Indeed, MPC Cashway Lumber and Building Studio, on the south side of Grand River Avenue, old US-16, just west of the Capitol City Airport, in Watertown Township, Clinton County. Between Ensel and Grand Ledge. Spur siding north off the CSXT Plymouth Sub. Final run of the remaining passenger trains 11, 12, 14 and 15, the Pere Marquette between Detroit and Grand Rapids were made on April 30, 1971. Last edited by railrod1949 on Tue Nov 13, 2018 1:59 pm, edited 1 time in total. Where be it? Some clues should be that Pacific Pride refueling station and the loco in the distance. ~Z~ wrote: Where be it? Some clues should be that Pacific Pride refueling station and the loco in the distance. You mean that loco right there? Ah ha, so JT knows where it is for sure. Any other guessers before JT spills the beans? Covington Road at the CN RR Pavillion Sub crossing, west of S. Sprinkle Road, south of I-94, in Kalamazoo, Kalamazoo County, That Pacific Pride refueling station is owned by the Kalamazoo Fleet Fueling Inc.
Last edited by railrod1949 on Tue Nov 13, 2018 4:48 pm, edited 2 times in total. I missed your two easy ones from last week. Had to get this one no matter how much searching it took. Correct, we're seeing GDLK switching a local industry here. Got another one; where be it? That was the bookstore in Rockford at one time right Z? 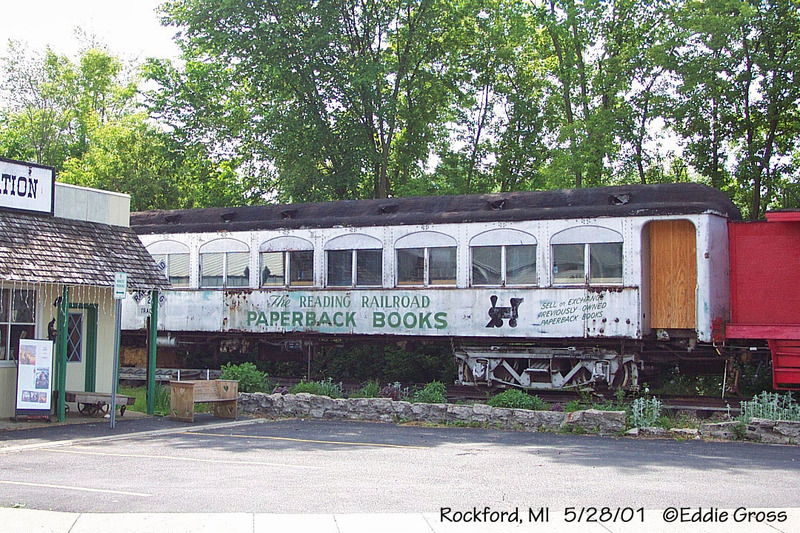 Michael wrote: That was the bookstore in Rockford at one time right Z? Dunno if that was a bookstore, but that is indeed Rockford. Says it was Choo Choo Law Office, but I see that's closed as well. I'll let someone else take a turn posting a where be it. The law office with the caboose and a passenger coach are both located on the west side of S. Squares Street and east side of the White Pine Rail Trail, just south of E. Bridge Street in downtown Rockford, Kent County. And another easy one. Come on, Z! Somewhere in West Michigan where you could once find street running on this industrial spur. Perhaps leaving the little map, along with the directional arrow, will provide some clues. J T wrote: Somewhere in West Michigan where you could once find street running on this industrial spur. Perhaps leaving the little map, along with the directional arrow, will provide some clues. Could you have made that any easier? Hello, Niles MI along Howard and 9th st. geezz..
j/k, i wouldn't have known without the clues. The part in the upper left where you kept "Michigan" but showed it was a very short city name helped. Had to throw you a softball after your three recent easy ones. However, next time I'll move the "Michigan" over to the far right to make it look like a loooooong city name. J T wrote: Had to throw you a softball after your three recent easy ones. However, next time I'll move the "Michigan" over to the far right to make it look like a loooooong city name. Yes, Howard and 9th streets looking southeast. Right. Zack already identified it above. Still in the Niles, MI area?